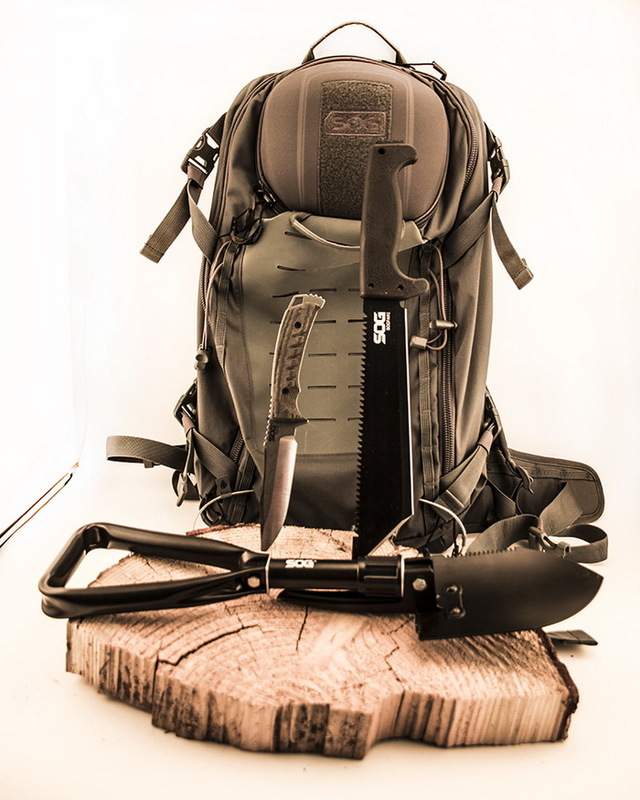 **** Chosen by Winner: Charles D.
Our friends at SOG Specialty Knives & Tools have assembled a very useful set of gear to help you enjoy or survive in the outdoors. 1) SOG SOGfari Tanto Machete - 10" MC04-N ($29) - The SOGFari 10" Machete is perfectly balanced in size and weight, for use in a variety of applications using the tanto blade or saw back. 2) SOG Elite E-Tool F19-N ($82) - This durable model with a collapsible handle is packable and portable, meaning you can have a shovel or entrenching tool whenever and wherever the need arises. 3) SOG Pillar Fixed Blade UF1001-BX ($254) - The USA-made Pillar is fully-equipped with a full tang CPM S35VN steel blade with a stone wash and machine ground finish, canvas Micarta handle, and Kydex sheath with an adjustable low-profile, locking mount. 4) SOG Scout 24 CP1004 ($190) - The SOG Scout does more than what you’d expect from a 24L pack. The panel loading main compartment has multiple interior pockets, padded laptop sleeve, hydration carry, and MOLLE loop field. Accessing the inside main compartment via the Quad-Zip means finding gear from the bottom of the pack doesn’t require unpacking everything on top of it. Any extra or bulky gear can be cinched on to the pack’s side compression straps, attached to the Hypalon MOLLE field, or held on by the Scout’s unique wire long item carry. The top molded panel allows quick access to smaller items. Due to the suspension, a fully loaded pack can be carried comfortably whether going for two miles or twenty miles.